Either that, or he has no idea what year it is. LONDON, England - President Obama and the First Lady traveled three years back in time to lay a wreath at the Grave of the Unknown Warrior at Westminster Abbey. 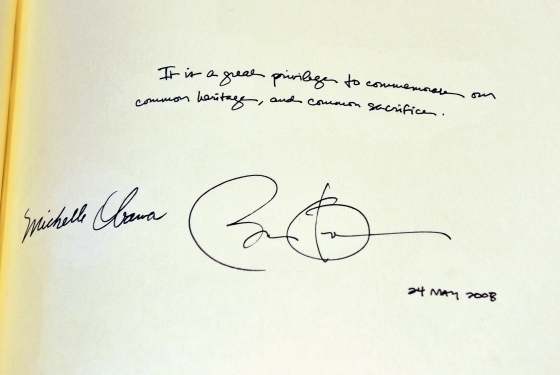 The time travel incident was confirmed by a source at the Abbey who stated that President Obama himself signed the guestbook on May 24, 2008. "I didn't think anything of it at the time," the source said, "but when the media began reporting it as if it had just happened today, I had to speak up about what I saw three years ago." It is assumed by some that the president visited Westminster Abbey today and simply wrote down the wrong date. Those close to Obama, however, find it difficult to believe that a man of his intelligence could have been off by three whole years. "Sure, 2008 was a really big year for him," a White House staffer said, "but time travel is the only explanation that makes any sense." The exact reason for the trip into the past remains unclear, as well as the means by which it was accomplished. There have been reports that there is a Delorean in the presidential motor pool, but those reports are as yet unconfirmed.